Parts of the old steamer HEADLIGHT were used in the building of the FAISON. Waybill L. Combs - the LESLIE COOMBS - at Powhatan Point along the Ohio River. Ran Cincinnati-Kentucky River, Capt. George Stivors, then Louisville-Madison, spring 1861, same master. Ran Marietta-Zanesville, Capt. A.B. Crane, early 1862. Ran Wheeling-Clarington, Capt. Fred Kimpel, 1866. 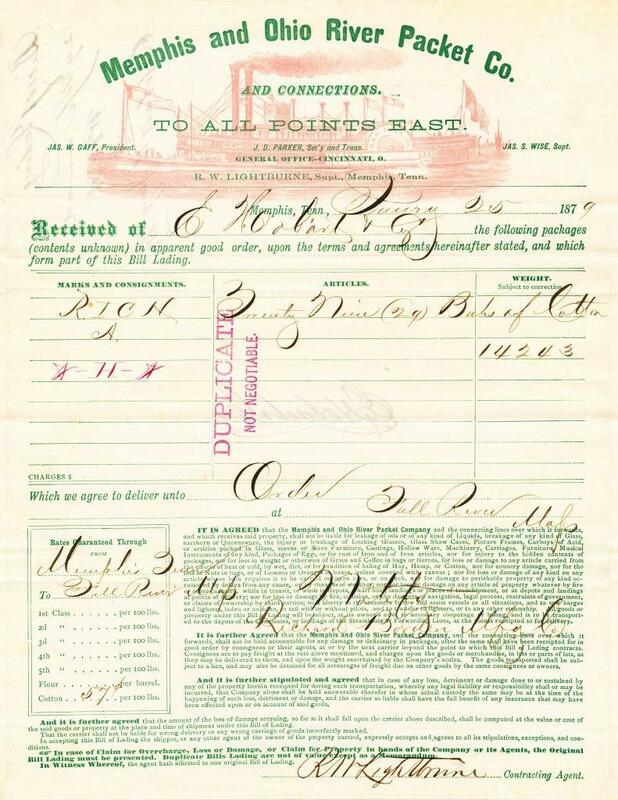 Went to U.S. marshal sale early 1869 and bought by Clark Hanes, Wheeling, West Virginia. He resold her to Portsmouth, Ohio, parties in April 1869. Brought two barges of railroad freight cars Cincinnati to Maysville, Kentucky, June 1871. Condemned at Ironton, Oh., September 1871, and was beached on the shore of the Kentucky River on April 8, 1872. Powhatan Point is a village in Belmont County, Ohio, United States, along the Ohio River. The population was 1,592 at the 2010 census. It is part of the Wheeling, West Virginia Metropolitan Statistical Area. Built for the Memphis and Arkansas River trade, Captain Woodburn. She had two bridal chambers opposite one another named "Tennessee" and "Arkansas" with beds a trifle high, equipped with short ladders for the bride to climb up. 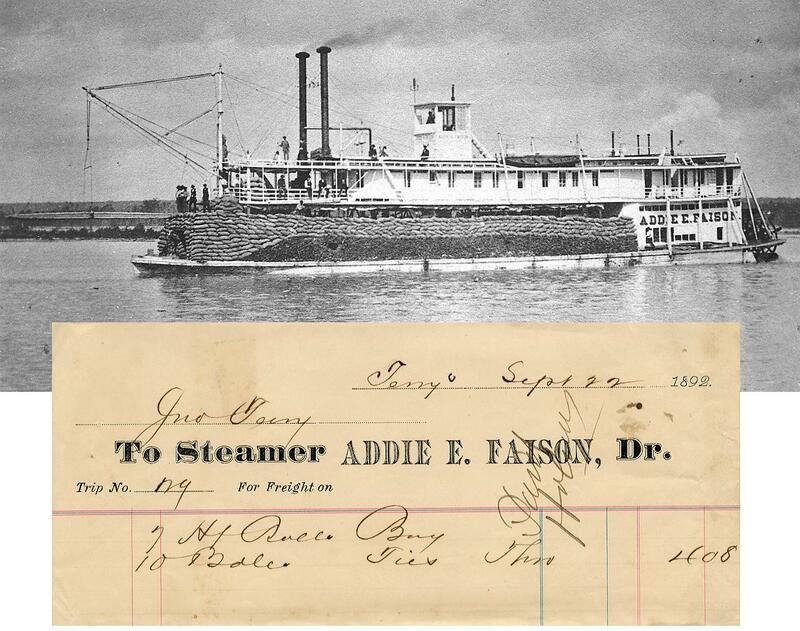 Built in the autumn of 1870, she got first inspection November 3, 1870 and was sold to the Evansville and Cairo Line, entering that trade December 20, 1870, with Captain G. J. Grammer, master and Nick S. Pennington in the office. She left Evansville at 4:00 P.M., three days a week. She was laid up at Evansville August 1880. One of my favorite waybills. The photograph of the boat leaves much to be desired and will have to suffice until a better copy of it turns up. "Ch Dog" under freight? Could it have been a "China" (porcelain) "Dog" that they charged a quarter to transport? 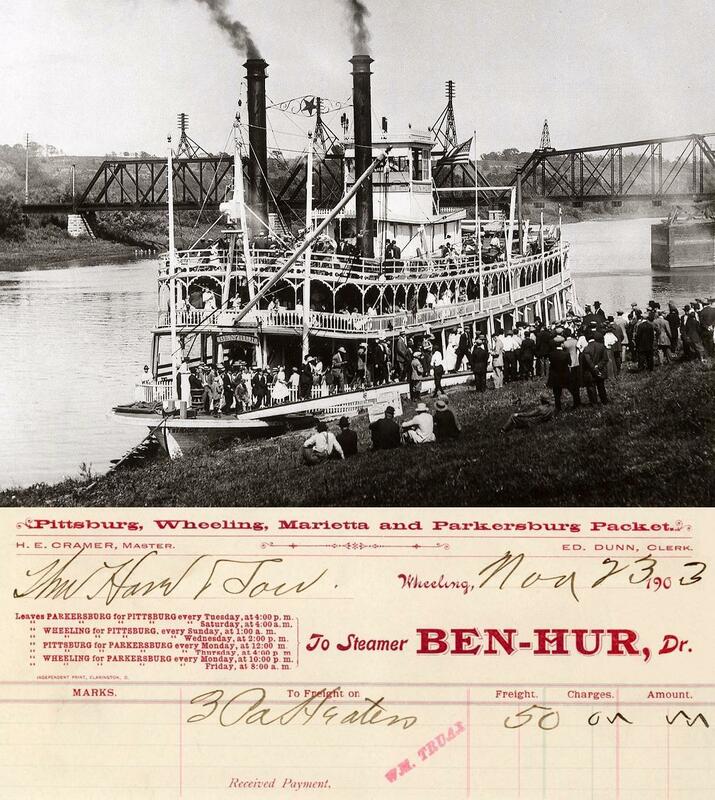 In January, 1895 she was moored at the Juliana Street Bridge in Parkesburg. She became speared on a piling when the river fell rapidly due to the breaking of an ice gorge at the head of Blennerhassett Island. She rolled over on her side and while being pumped out, she rolled over a second time. Later, she exploded a boiler while racing another boat at the mouth of Hughes River. The cabin forward of the pilothouse was blown away. On January 26, 1902 at 7:00am she sank at Creston, West Virginia. Her hull seams were cut by ice. She was raised and returned to Parkersburg under her own steam and while awaiting her turn at the docks she sank and turned over. She was then dismantled. Photo Courtesy of Murphy Library at the University of Wisconsin - La Crosse. Waybill from the BEN HUR dated November 23rd. 1903. The photo is from the La Crosse collection. Built in Harmar, Ohio, at the Knox Boat Yard in 1887. 165 x 30.5 x 4.8. Engines, 16's- 5 1/2 ft. Three boilers, 42" by 24 ft. Her machinery came from the towboat ED HOBBS. The BEN HUR came out in the Pittsburgh-Parkersburg trade with Capt. Fred Kimpel, Jr., master and Ed Dunn, clerk. During her first year she carried John Robinson's famous circus on tour with pilots Monroe (Doggy) Cross and Bert Cramer. By 1904 her master was Capt. Ed Sims. Capt. Harry Donnelly had her briefly. 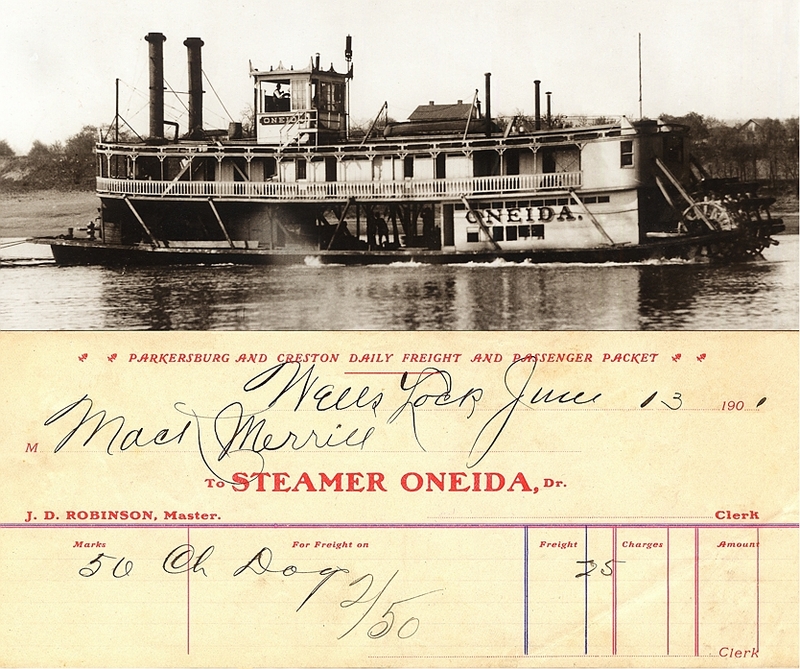 In June 1904 sold to the Mississippi River Amusement Co., St. Paul, Minnesota and went there to run excursions. Capt. Tom Morrissey bought her for trades out of Vicksburg, and she soon was transferred to Prince & Wild. In 1912 was running New Orleans-Bayou Teche twice weekly, Capt. Wallace M. Ditch, master, with W A. Roberts and Warren Kouns, pilots, managed by Capt. L. M . Gray. While owned by Capt. George Prince she sank and was lost at Duckport, Louisiana in March 1916. Her three-chime whistle came from the GEORGE STRECKER (1880-1887) made by a mechanically-minded farmer who lived above Waverly, West Virginia. 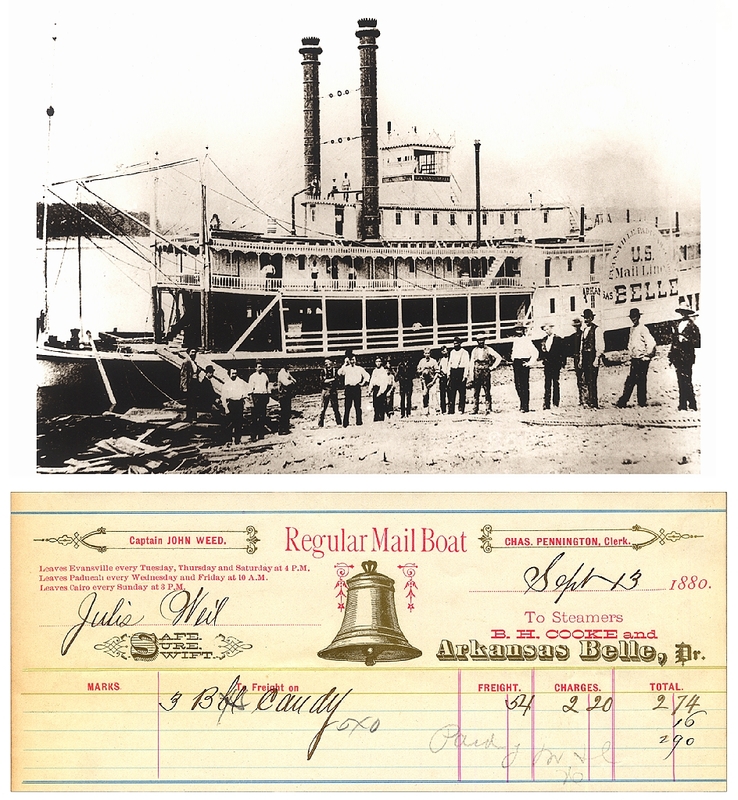 After the BEN HUR went to St. Paul in 1904, her whistle went to the BESSIE SMITH, then to the LIBERTY and finally to the towboat MILDRED. Today the whistle is in the collection of the Missouri Historical Society. "The one that got away." I didn't see this listing but "leelinesteamers" did in 2013. Have extended the margins and saturated the image in the attached file. Can't fine the name of a specific Memphis & Ohio River packet listed on the waybill. 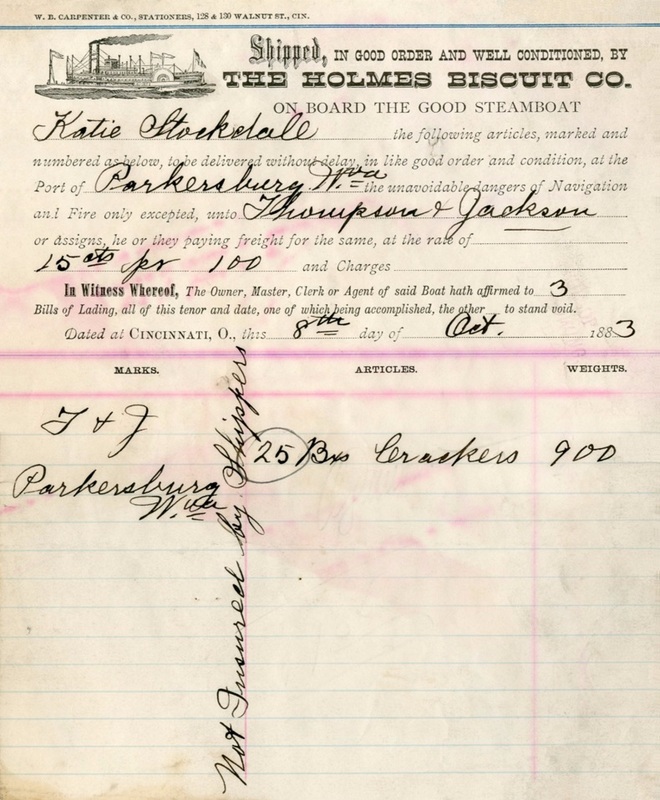 Waybill from the KATIE STOCKDALE dated October 8, 1883 for 25 boxes of crackers sent by The Holmes Biscuit Co. in Cincinnati, Ohio to Thompson & Jackson of Parkersburg, West Virginia. In 1877 th hull was built in California, Pennsylavania and the rest of the boat's construction was completed at Pittsburgh. 228 x 34.5 x 5. Engines, 16's - 7 foot Four boilers. Originally owned by J. T. Stockdale (one-quarter), Willis Stockdale (one-half), and Thomas S. Calhoon (one-quarter). Named for youngest daughter of J.T. Stockdale. 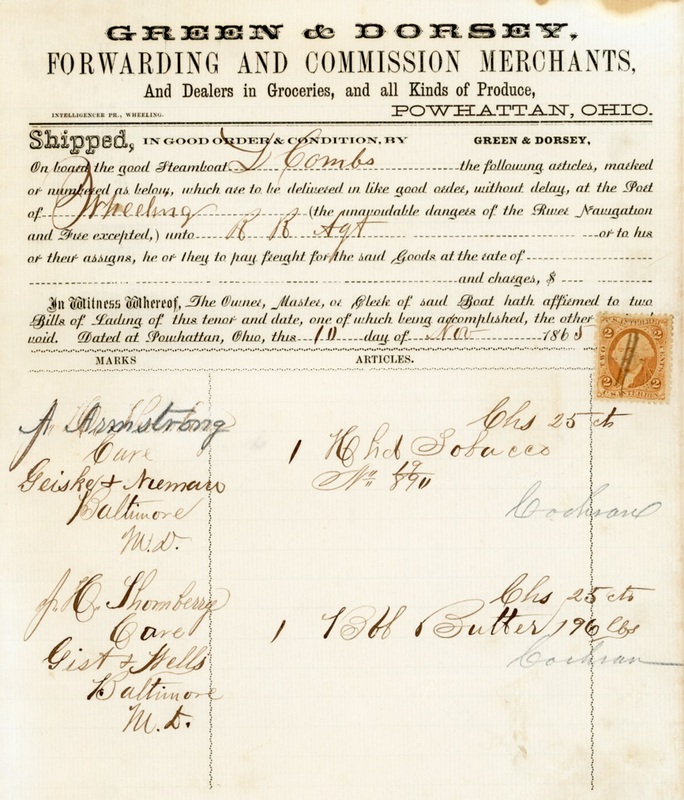 Entered Pittsburgh-Cincinnati trade, December 1877, Capt. T. S. Calhoon. Clerks included Nat Earhart, Martin F. Noll, C.M. Buchanan, C. Barringer, H.C. Caldwell, A. J McConnell, and Charles W. Knox. Whistle and cabin furniture came from the GLENCOE. James Rowley, Sr. and George Hughes were the original pilots on her. She came out with plain-topped stacks but had fancy tops added, similar to the SCOTIA's in August 1880. Sank in a collision with the towboat B. D. WOOD on February 3, 1882. Started out as the Saturday boat out of Pittsburgh but by 1882 swapped over to become the Monday boat. On February 10, 1884, the pilot house was sawed off level with the pilot wheel to get her under the Parkersburg bridge. The iron paddlewheel she came out with was not successful and was replaced with a usual one. Dismantled at Harmar in 1890 and her equipment went to the new KEYSTONE STATE. The hull with cabin intact was towed to Pittsburgh and rebuilt into an excursion barge for John F. Klein, renamed CITY OF PITTSBURGH, later IDLEWILD, neither name approved by U.S. Customs and she again became KATIE STOCKDALE. Sprung a leak and sank at the Pittsburgh wharf August 2, 1895, at 5:00 A.M. The wreck was raised, towed to the head of Davis Island, Ohio River there beached and burned. Built at Dubuque, Iowa, 1888. 216.4 x 33.9 x 6. Engines, 17's - 7 ft. Four boilers, each 40" by 24 ft. The Iowa Machine Works built this long, slim steel hull packet for the St. Louis-Memphis trade. 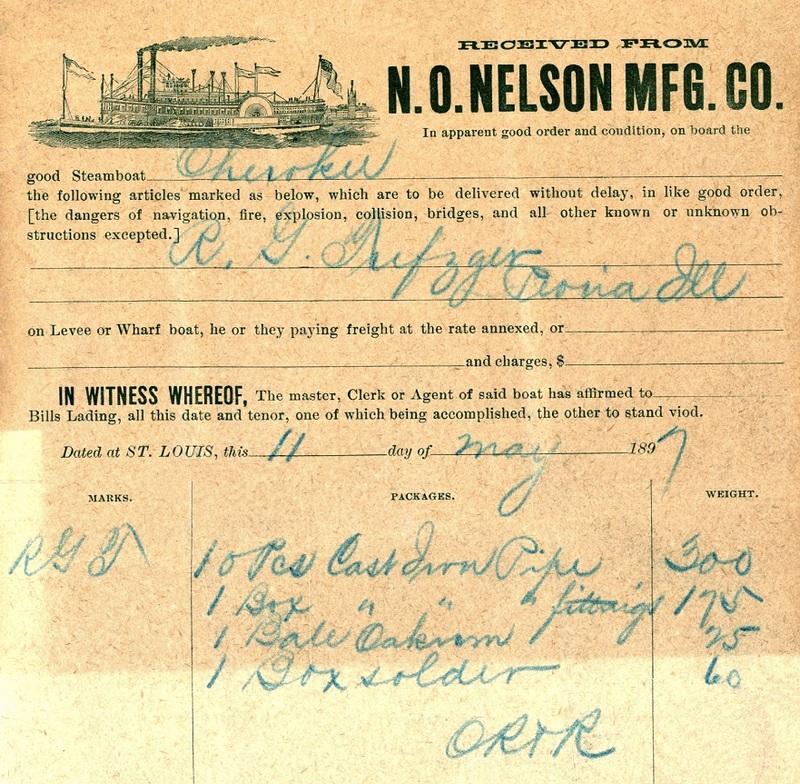 In 1894 she made a special trip St. Louis to Shreveport with groceries and hardware, Capt. Henry Keith. In 1897 she ran St. Louis-Illinois River in place of the D.H. PIKE. About 1906 she was sold to the St. Louis & Chester Packet Co. and renamed CHESTER. Sidewheeler built at Cincinnati, Ohio 1849. 199 tons 161 x 25 x 5. Went to New Orleans, owned in part by Capt. L.G. Moore, master of Union County, Arkansas, who was associate with the boat until 1853. Thenceforth control was in the hands of Samuel Ayles, New Orleans, Capt. A.P. Hyatt, master. Off the lists in 1856. Sidewheeler built at Jeffersonville, Indiana in 1850. 304 tons, 179.7 x 28 x 6.3 Went to Mobile, Alabama. She was returned to New Orleans in 1856, then owned by Robert S. Kirk, Mobile (3/4 interest) and her commander Captain John C. Graeff. Sold September 1857 to Captain William Risher, Concordia Parish, Louisiana. Burned and lost at Algiers, Louisiana on 29 June, 1858. 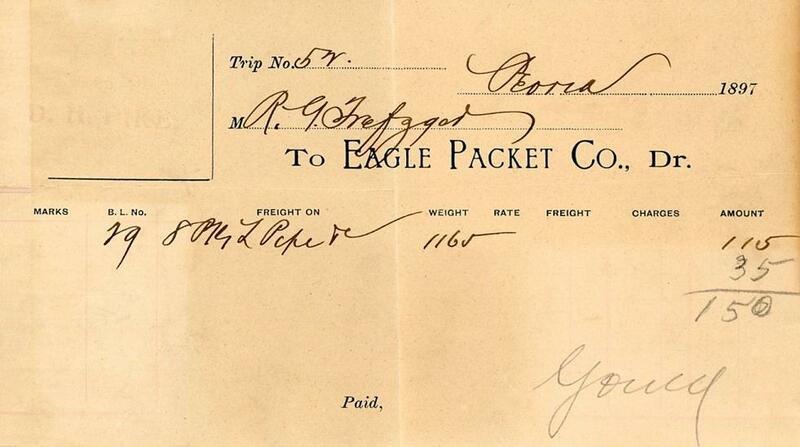 Waybill from the Eagle Packet Co. at Peoria, Illinois 1897 for the steamboat D.H. PIKE whose name is very faded and barely readable in the upper left corner of the document. Originally the BENTON McMILLIN built at Jeffersonville, Indiana in 1883. The McMILLIN was lengthened to become 199.6 x 33.5 x 5.5 by Eagle Packet Co., which ran her between St. Louis & Peoria in the 1890s. On one occasion the St. Louis firm Scharff & Berneheimer chartered her, loaded her out with groceries, sundries, etc., and went to Knox's Point on the Red River, with her. She was dismantled in 1898 and parts were used in building the BALD EAGLE. 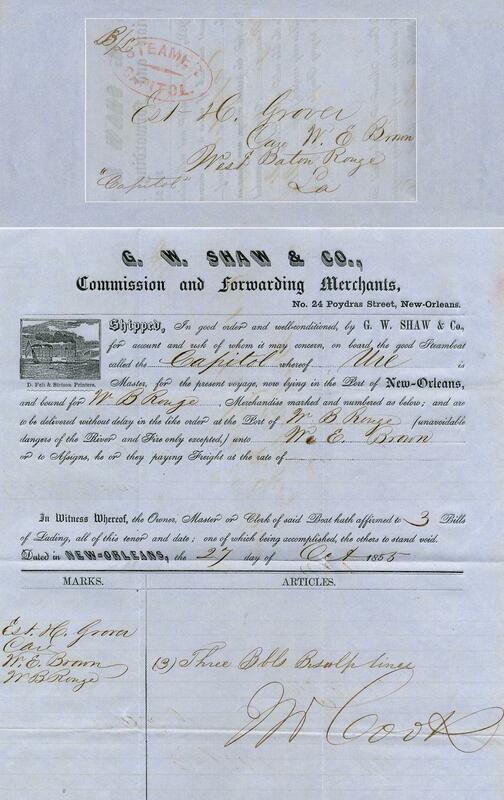 Blue folded printed waybill (G. W. Shaw &Co. - Commission and forwarding agents, New Orleans), datelined "27 Oct 1855,"
The CAPITOL, a steamboat of 224 tons, was built at Jeffersonville, Indiana in 1854 for Capt. James H.Ure for the Bayou Sara (St. Francisville) trade.